Photo by author. Her favorite breakfast at a Chicago cafe. An American breakfast is simple. Or so Anita Chou thought. It is the 1980s and Chou is trying her hand at her first breakfast in America. She is resting at a small diner in Los Angeles, Calif., after a 14-hour flight from Taipei, Taiwan. Her English still needs some work, so sheâ€™s careful to choose the simplest menu item. The American breakfast. One, please. â€œHow would you like your eggs?â€ the waitress asks. â€œBacon or sausage? Toast or pancakes? White or wheat? Jam or butter?â€ Chou stalls, surprised by the number of options. Too many questions, too soon. She thinks fast and fumbles to finish the order. What type of eggs do you have? Scrambled, fried, over easy, sunny side up. The list goes on. Finally, she pulls through. Scrambled eggs, bacon, toast, white, with butter. She sighs. And a coffee, too. Anita Chou is my mother. I have heard this story multiple times, and each time I am struck by the hardships that dwell behind such an innocent anecdote. My mother and father, recent college graduates, were one of the few to leave their families for America, struggling to make it in a new world where the task of ordering breakfast was anything but simple. Before moving to America, my mother had breakfasts of hot soy milk, sticky rice balls and eggs fried with scallions wrapped in a tortilla-like pancake. My father enjoyed eggs, over easy, with soy sauce. Both ate plain porridge with seaweed, pickled vegetables and pork-fu (shredded dry pork). I inherited those Taiwanese breakfasts, but I also grew up with breakfasts of cereal and milk, croissants, bagels and toast. I drink Oolong tea and Lipton, coffee and hot soy milk. 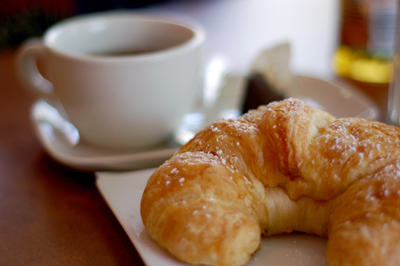 Quite honestly, my favorite breakfast would be a simple, toasted croissant and Earl Gray tea. This is the food of my family. White rice, hot pot, whole fish (with heads and everything), and vegetables I only know the Chinese name for. At the same time, my mother bakes racks of lamb with rosemary, has the best spaghetti recipe and makes a mean clam chowder. She is a food lover, as am I, and the food served on our dinner table is an eclectic mix of all types of food. My mother still has â€œhome food,â€ if you know what I mean. She prefers gnawing on a sugar cane instead of bubble gum. She likes Chinese-style seasoned lobster more than lobster tail with drawn butter. And when she craves food from home, sheâ€™s craving Chinese noodles, pigsâ€™ feet and a stinky tofu I canâ€™t stand. My home food is my motherâ€™s food. I remember losing my teeth on sugar canes as a 7-year-old. When I miss home cooking, I miss my motherâ€™s curry, her steamed fish and her Chinese soups. And sometimes, I miss her spaghetti the most. I am, after all, Chinese American.